If you're looking to increase your intake of vitamin C, there are many fruits and vegetables that are rich in this essential nutrient. According to the Office of Dietary Supplements, vitamin C has several important functions in the body. It helps form collagen, a protein that gives structure to bones, cartilage, muscle and blood vessels, and is required for wound healing. As an antioxidant, vitamin C protects cells from the damage caused by free radicals. It helps the immune system work properly and improves absorption of iron from plant foods, too. Eating lots of fruits and vegetables high in vitamin C may also reduce your risk of cancer and heart disease. The Institute of Medicine recommends daily intake of 75 milligrams of vitamin C for women. Aim for 85 milligrams during pregnancy and 120 milligrams if you're breastfeeding. Add an extra 35 milligrams daily if you smoke. Because vitamin C is a water-soluble vitamin, it is not stored in the body, which means that you need to include this essential nutrient as part of your daily diet. 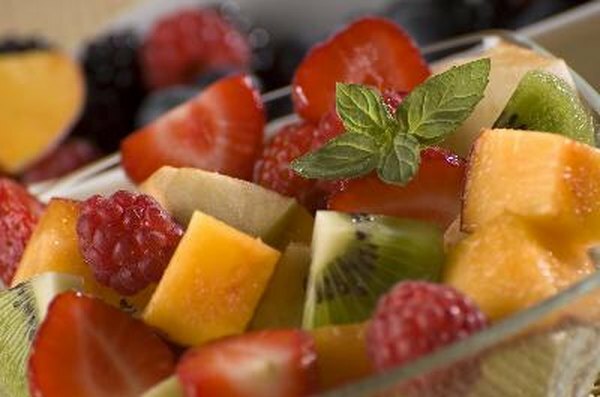 Many fruits are a good source of vitamin C, but the stars of the fruits include citrus fruits, such as oranges, grapefruits, lemons and limes, as well as strawberries, blueberries, blackberries and raspberries. Kiwifruit is another top source and 1 fruit supplies 64 milligrams of vitamin C toward your daily goal. Melon, such as cantaloupe and honeydew, kumquats, pineapple and mangoes also supply a good dose of vitamin C.
Red bell peppers are among the top vegetable sources of vitamin C with 95 milligrams per 1/2-cup serving. Green bell peppers supply 60 milligrams in a 1/2-cup serving. Brussels sprouts, broccoli, tomatoes, cabbage, spinach and green peas are good sources of vitamin C, as well. Other vegetables that are supply vitamin C in lesser amounts include raw kale and cooked cauliflower and kohlrabi. Vitamin C is added during manufacturing to several foods that would naturally contain little or none of this nutrient. Examples include apple and grape juice, fruit drinks, fortified cereals, malted chocolate drink mix and fruit snacks. The fortification level varies from 10 to 100 percent, so check the food label. Also, products like fruit drinks or fruit snacks are high in simple sugar and don’t contain the other vitamins, minerals and fiber that you would get from eating a serving fruit or vegetables, so they wouldn’t be the “best” choice for getting your vitamin C.